On June 12, 1990, Norwegian Cruise Line ordered two cruise ships from the French yard Chantiers de l'Atlantique. At a time when other cruise lines were building big Panamax ships, of 70,000 gt size, the two ships were medium size designs intended for world wide use. Nearly at the end of 1992, the first of the pair, the Dreamward, was delivered. She was a marketing dream. But also a headache, due to the troubled finances of the Kloster group that, in those years, had three branches: the mass market Norwegian Caribbean, the premium market Royal Cruise Line and the de luxe Royal Viking Line. Later, in the mid nineties, both Royal Viking Line and Royal Cruise Line disappeared, because Kloster chose to concentrate his efforts in the mass market oriented NCL. The Dreamward and her sister Windward were built initially for NCL, but they were marketed towards the upper part of that segment (Royal Cruise Line), and furthermore their space ratio and layout made them less of a mass market vessels. These ships substantially upgraded the company's capabilities, and thus began the period of the replacement of the old and small ships of the pioneering White Fleet. Those aged ships, like the Starward, the Southward, etc., were built in the late sixties and couldn't compete with the third generation cruise ships built in the mid eighties, like the Holiday trio, the Song of America, etc. Shortly after the pair was delivered, NCL changed its corporate identification that represented a break with the past. The new company logo was a dark blue funnel with a new logo featuring the letters NCL in gold. The Dreamward, as originally built, had 13 decks and space for a maximum of 1,500 passengers in 623 cabins (1,246 was her normal load), of which 85% had exterior views and could accommodate a third passenger by converting a sofa if necessary. 78 cabins, 15% of the total accommodation, had removable partitions for conversion into 39 suites. These cabins were located on the five lower decks for passenger use, and in the forward part of the International and Star decks. The cabin decoration featured pastel colors, wood closets and a warm décor. But she had only 49 cabins with balcony and the standard cabins had two big problems: few drawer spaces, which meant taking few clothes and inconveniencies on longer cruises. The fact that all cabins had sitting area meant less free space and difficulties in movements. The ship had flexible partitions, disappearing beds and clever use of the decoration and space which meant that the accommodation could be sold at various prices and to various markets, such as families, business incentive or singles. All the cabins had television and there were some special cabins for the deaf. The Dreamward's innovative design created the excitement of a big ship with the intimacy of a smaller vessel. Extensive use of panoramic windows, terracing floors to enhance the views, all added to the beauty and charm of this graceful ship. Her inside designers were the famed Norwegian architects Yran & Strorbraaten, their design enhanced the privacy and intimacy of the public areas, which were located in the aft part of the International and Star decks. Her main feature was four different restaurants, the largest of which, The Terraces, could accommodate 282 passengers with the seaview through large windows on three sides. Her outside design was well balanced, with a terraced stern that houses an aft pool. The amidship pool was also cleverly designed. Forward, the superstructure also has a slope profile, as well as her radar mast. 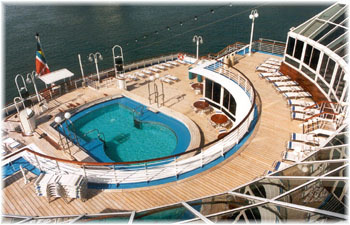 Her tiered pool deck, on which passengers have five terraces for sunbathing, was innovative at the time. The only mistake was her large, ungainly funnel, that surprisingly later became a trademark of NCL. The Dreamward was delivered on November 4, 1992 and left St. Nazaire for London, her first port of call. On that occasion, the ship broke a record, that of being the largest cruise ship to sail up the Thames. Later, she headed for USA, and made promotional calls in Boston, New York, Philadelpia and Baltimore, before being christened by Diana Ross on December, 5, prior to her first cruise that begun one day later. In the first years the Dreamward was used for two competitive markets. Western and Eastern Caribbean seven day alternative cruises from ports in Florida in winter and Bermuda and Canada/New England itineraries from New York in summer. The NCL financial state got worse and, at critical moment, with debts mounting nearly $1 billion and some people thought that NCL was near bankruptcy. But after it was purchased by a group of Norwegian investors in late 1995, this fate changed. Kloster Cruise became Norwegian Cruise Line and the parent company, Vard A/S became NCL Holdings. The NCL huge debts were refinanced and the new management began working towards an expansion plan. Both second hand purchases and new buildings were planned for the fleet. Furthermore the fact that the two French built sister ships were originally designed for a later lengthening was an opportunity for the company. In those years, Norwegian Cruise Line competed against the industry's Big Three: Carnival Corp., Princess Cruises and Royal Caribbean. Yet unlike its rivals, NCL weathered rough financial waters in the 1990s, which considerably slowed its newbuilding orders. Earlier in 1997, NCL seemed to be falling even farther behind, as the Big Three extended their massive shipbuilding programs of post panamax cruise ships. In order to remain the world's fourth biggest, NCL had to strengthen its position in the American mass market very quickly. Under an intricate expansion and development plan, NCL lengthened two ships and added several vessels - including two panamax new ships, to its fleet by 1999. This plan meant that NCL wanted to increase its berth capacity by 43,7 %, to 15,782 berths. Later, those plans were changed: only one new ship was delivered, but a third ship was lengthened. As far as marketing is concerned, NCL renamed all the vessels of the fleet and introduced a handful of new itineraries, in Europe, South America, etc., as well as theme cruises. Its Executive Vice President Bruce Nierenberg, said that renaming the fleet, excluding Leeward and Norway, adding the word 'Norwegian' would strengthen the image of the company, and that the recognition of the name is an important factor in the choice of a cruise. Furthermore he wanted to put in evidence the value of their Norwegian seamanship on the fleet. NCL wanted to become different from all other vacation choices. Through the plan, NCL lengthened and upgraded the sister vessels Dreamward and Windward at the German yard Lloyd Werft. 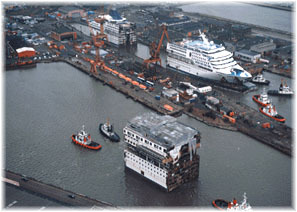 The ships were stretched during the first half of 1998 in Bremerhaven, Germany. The Dreamward ended service on March 1, 1998, and resumed on May 14. A new, 40 meter long section, weighing approximately 1,900 tonnes, were added to each ship, increasing ther capacity by 40 percent, by 512 berths each (256 cabins). The Dreamward's capacity went from 1,242 passengers to 1,754, and her size grew from 41,000 to 45,000 gross registered tons. In total, over 25,900 square meter of new carpeting was laid throughout the ship. Her original designers, Petter Yran and Bjorn Storbraaten were overseeing the conversion of the Dreamward. A second noted design firm, Tillberg Design of Sweden, also worked on the project. Besides the addition of her mid-body extension the Dreamward funnel and forward mast were cut and hinged so she could sail under the eight bridges of the Kiel Canal. So, when delivered as Norwegian Dream, the ship became the only one in the world with this unique funnel arrangement. Following the eight week lengthening, the Norwegian Dream resumed service from Dover on May 14. Her first voyages were a series of Baltic cruises, in which she made use of her hinged funnel device. Dining options on the Norwegian Dream and her sister were very interesting, particularly for groups. Both were the first cruise ships with this dining arrangement, which were later expanded and refined on the later big NCL ships. 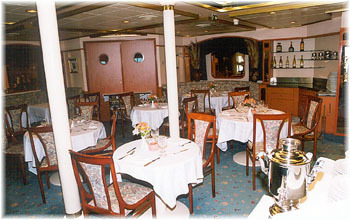 The ships had originally three main dining rooms of various sizes: The Four Seasons which seated 484, and The Terrace which seated 336 were located on International deck, which also housed the main galley on port side and the alternative dining room, the Bistro which seated only 78. The third of the main dining rooms was the Sun Terrace which seated 258, and was located aft on the Sun Deck. This arrangement made it easy to convert them to Freestyle Cruising, a new NCL trademark, which was adopted on April 30, 2001. The only restaurant which was expanded in the stretching operation, was The Four Seasons dining room. 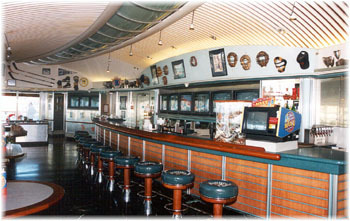 It is located mid-ship on International Deck, and is the ship's largest dining room seating 452. After the lengthening, The Four Seasons has a completely new look and its seating capacity was increased by 206 seats more. Four terraced areas provide excellent sight lines, even from the middle of the dining room. Interestingly, it hasn't stairs, only ramps, which mean better wheelchair access and waiters flow. The ceiling is decorated in white, with an etched glass central section, with a big chandelier. I think it is plain, worse than the pastel decorated walls, plenty of oil paintings. On both sides it has floor-to-ceiling bay windows, which are outside the ship's hull, and give the passenger, at the closer tables, a feeling of floating on air, over the water. The Bistro, an alternative restaurant is a nice small and intimate room. It is found in the corridor between the two main restaurants, on International deck. It offers the same dinner menu during the entire cruise with the addition of nightly specials. The Bistro is normally available on a sign up basis but special arrangements can be made for groups. This is a dark, quiet room, with a square table that shows the menu. The ceiling has golden details, and the walls have a lot of "windows" and mirrors, and some curtains, to add more sense of space. It can be separated from the corridor to give it more intimacy. To accommodate the additional capacity, the two other existing dining rooms were expanded and refurbished with new carpeting and furnishings in the stretching operation. Both The Sun Terrace and The Terraces dining rooms were also expanded with additional seating. The Terraces, a splendid room, is located aft on International deck. It has a horseshoe lay out, and is arranged in six terraces around the aft pool. I think this restaurant is one of the best afloat, and transmits a great sense of roominess. This high ceilinged room has large windows both sides and aft, all fitted with green curtains, which give splendid views of the ship's wake. The decoration is mainly violet and green, with a lot of natural plants and wood that gives this room a fresh ambience. The forward wall features a big painting of a nautical motive, as well as golden lights located on top of some columns. I mainly enjoyed the indirect lighting and the ingenious sun protection devices, which help to keep this room cool, and avoid dazzling. The Sun Terraces restaurant is located above The Terrace restaurant, and also has the same terraced lay out, but has more slope, and better views. The furniture is imitate wicker, the ceiling has ventilators and the floor is in wood and there are a lot of plants and so, this room has a tropical ambiance. The ceiling has golden and stainless steel frames, and doesn't fit well with the rest of the decoration. Floor to ceiling windows are on three sides. They are fitted with flower decorated partitions, giving the passenger splendid views. It has its own galley port side, and two private dining room port side, available for exclusive parties. But the ship lacks a true informal buffet near the pools. The Sport Bar doubles as an indoor-outdoor buffet but it is small and very crowded. The Stardust Lounge is a two deck high main showroom on the ship, it can seat 500 people, and is located amidship on Star deck. It has an interesting lay out. The sides are higher than the central section, both are tiered, and are only with sofas. The lounge has splendid violet upholster sofas and chairs, and low glass made round tables, compared to row seating found on most ships today. The way the seating is arranged makes this room versatile, and so it works well for cocktails, lectures, etc. The floor is decorated in blue tones, and the walls and ceiling in pastel ones. There are twelve pillars, but the sightlines are very good, except in the two side section aft. The ceiling is terraced as well. On both sides there are two rows of windows, fitted with curtains, which make this room very bright in the daytime. Between the windows there are some columns covered with mirrors and this increase the height perception. Like aboard the other NCL's ships Jean Anne Ryan Company produces all shows, which offer a nice variety and beatiful costumes. I enjoied this room, one of the few real main lounges afloat today. The corridor located starboard on International deck, between the two main restaurants, houses some interesting rooms. The Coffee Bar is centrally located on this corridor and has 148 seats. It is decorated in green tones featuring a beautiful glass counter with inside lighting. It has plenty of curved walls and quiet niches, and it also serves as an ideal place for reading and relaxing. Nearby is located the circular shaped library, that also works as Internet cafe' and card room. In addition to full bar service, a selection of coffee and coffee-flavoured drinks are served. Old coffee memorabilia such as antique coffee machines, cups and saucers are displayed in cases. Forward is located the Rendez Vous Bar, that works as a meeting point before eating at the Four Season Restaurant. The counter is in wood and wines, that you can enjoy later in the restaurant, are displayed. On Star deck, aft the show room, is located the Montecarlo Casino. This room was built in the 1998's lengthening, and is bigger than the former one, located near the central pool. The Norwegian Dream casino is decorated in hot magenta and black, and hasn't windows, but the light arrangement is good. The furniture is black as well. The center of the floor is higher than the sides to give more height to Four Seasons restaurant below, and features Art Deco style decoration. The 450 square meter casino occupies the full width of the ship and so you have to pass through it. The Montecarlo Casino offers eleven tables in the center and 158 slot machines both sides. Aft the casino, on Star Deck, is located Dazzless, a 174 seat disco. It has a blue atmosphere with a circular wood bar and elliptical wood dance floor arranged starboard. A series of curved sofas covered in velvet spiral patterns are positioned throughout the room. Dazzless offers live music and late night disco. Passengers have the advantage to choose between the casino, Dazzless and the quieter atmosphere of Lucky's Bar without moving all over the ship. Lucky's Bar is one of the better designed rooms on the Norwegian Dream. I appreciate mainly the curved counter, made in blue glass, and located behind an elliptical skylight. The ceiling, made with opaque glass around the funnel casing, forms a horseshoe. It houses all lighting equipment and completes the skylight effect. A marble dance floor is located in front of the counter. It's decorated in violet and blue tones, with comfortable sofas on the sides and chairs around small rounded glass tables. Glass screens divide the room in small and intimate areas. Aft on this deck is located Galleria, a shopping complex arranged around the funnel and the aft stairs, with two curved corridors fitted with green tapestry port and starboard. There are five large shops and a photo gallery located port side. The ceiling doesn't go well with the decoration, and it's one of the poorly decorated rooms aboard. Above the shops, on Sun deck, the Norwegian Dream has a small conference room that can hold up to 36 people for smaller meetings. 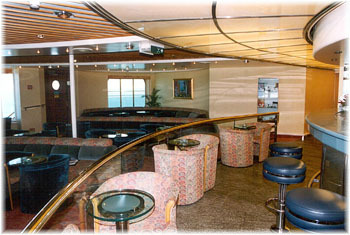 The Observatory Lounge, arranged on the uppermost deck, has a terraced floor and ceiling, with a radial lay out around a semicircular marble dance floor located forward. It can hold 220 passengers and is a great panoramic room, surrounded by panoramic window around. It's clearly influenced by the Stella Solaris lounge of the Royal Viking Sun, also created by Yran & Storbraaten, and has floor and upholstery in green and blue tones as well. The ceiling follows the terraces of the floor, with metallic and wood frames. The counter is located aft the room, and is marble made. This room is used very little and is available for cocktail parties and other functions. The Sports Bar & Grill is located aft and, like the two restaurants behind it, has three side picture windows with excellent sun screens. The floor is in wood inside and outside and the furniture is upholstered in blue. The outside chairs are in plastic, and heavily contrast with the rest of the furniture. It has 12 television screens behind the rounded wood made counter to get the latest scores. Sport memorabilia such as baseball and basket balls, antique NBA and NCL uniforms, etc. are displayed in cases. Both indoor and outdoor seating are a great places to get away while having lunch, but are small and usually crowded. 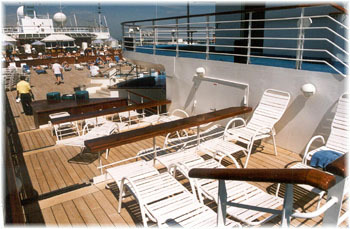 The Sun Deck is extremely large and well laid out on the Norwegian Dream. It offer two very different pool areas. The forward one has a swim - up bar seating 15 and can also accommodate 24 persons along benches surrounding the splash pool, and two large covered jacuzzis. The other area is aft and has a larger square shaped pool. Between them there are three new elevators that were added to the new mid section fitted on the ship in the lenghtening. The forward area has a terraced arrangement too, resembling an ampitheatre and offers ample room for all passengers. On the upper part of the terraces a beautiful varnished teak bar runs the entire width to serve the sunbathers. An ice cream parlour is located here as well. This area is in teak and thanks to the unique lay out it is possible to have private functions on deck. The aft area houses a larger pool, but the deck is in Astroturf. Topsiders, an outdoor caf� in a beautiful varnished teak, ends aft. It has 120 seat capacity and offers casual eatery in breakfast, luncheon buffets and snacks. Nearby are located the golf driving net and a ping pong table. The second pool is surrounded by teak and sheltered, on Star deck, by a horseshoe shaped sun bathing zone. The gym and spa facilities are all located on the Sports deck, between the Observatory Lounge and the pool area. This area is 220 square meters and offers great views through picture windows. This facility, a full service spa with eight private rooms for treatments including massage therapy, herbal wraps and facials, and a gym area which was doubled in the lenghtening, is fitted with the best exercise equipment. This facility is small by today's standards, and doesn't suit well in the NCL marketing. Kids Korner is on Sun Deck, a new children's playroom that is the base for NCL's year-round "Kid's Crew" program. Supervised by trained youth counsellors a wide variety of activities are offered including dances, arts and crafts and "Circus at Sea," a popular program in which children learn circus routines. Above is arranged the Youth Center/Video Arcade where teens and adults alike can enjoy their choice of games. The ship features a complete round promenade in Astroturf on deck 7 and a full size basketball court on Sky deck. Embarking passengers enter a new 300 square meter entrance lobby/reception area located on Promenade deck. There is a 24 hour reception desk, the information and concierge desks, the purser's office as well as a bank counter and a sales office. The shore excursion desk is also located here. This impressive new entrance features a white marble floor and an opaque glass "dome" in the center of the room. The entrance has a prominent Nordic motif in wood and green tones with Art Déco-style lighting fixtures. The Norwegian Dream offers a total of 870 cabins: 658 are outside cabins, which include 153 suites, and 212 inside cabins. Color TV, safe, shower, phone and hair dryer are standard equipment in all cabins and suites. All cabins and suites were completely redecorated in the lengthening operation, in shades of blue, teal, beige and rose with new carpeting, curtains and furnishings. Duvets replaced the bedspreads. The 18 Owner suites range in size from 31.2 to 35.6 square meters and have balconies. Twelve of them were added in the lengthening operation and are located on Sun Deck. These suites accommodate up to five persons. Each suite features a separate bedroom and living room. convertible double sofa in the living room, a stereo system and refrigerator. The bathroom has a tub and a shower and there are two entrances from both the hall and the bedroom. The doors open into the balcony. The 62 Superior Deluxe Penthouses are 19.2 square meters, including the balcony. The 73 Superior Deluxe Suites are 16.35 square meters and feature floor to ceiling windows. The above three categories come with concierge service. Standard Category outside cabins are all 14.1 square meters and have twin or queen size bed and a small sitting area with a picture window. All of the cabins are decorated in lighter colored woods and warm pastels. After the lengthening the Norwegian Dream began to sail European waters every summer and offered 7-night cruises from San Juan to the southern Caribbean in winter. But later NCL announced she will replace the Norwegian Majesty in the South American 2000-2001 season, due to growing sales. Later, in the summer season, she sailed 12-night cruises in Europe. 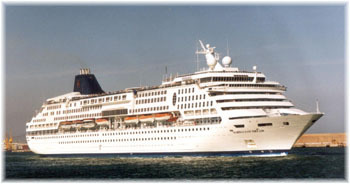 In winter 2001-2002 the Norwegian Dream operated longer cruises in South America. This summer the Norwegian Dream is back in the Mediterranean and in Northern Europe offering two week long cruises from Dover and Civitavecchia. The Norwegian Dream is well laid out and the lenghtening made her even better. The ship combines the amenities found on some of today's new post Panamax megaships with the intimacy of the yacht style small luxury cruise ships. I mainly like the windows and the walls of glass in the aft restaurants which make her a roomy and light ship. I also like the soft pastel decoration, without any stridence, and the quiet intimate places. The three different dining room sizes is particularly interesting. What I don't like is: when full some areas seem overcrowded, mainly the show room, with long line-ups, and the access to the forward cabins on International and Star decks is mazy.